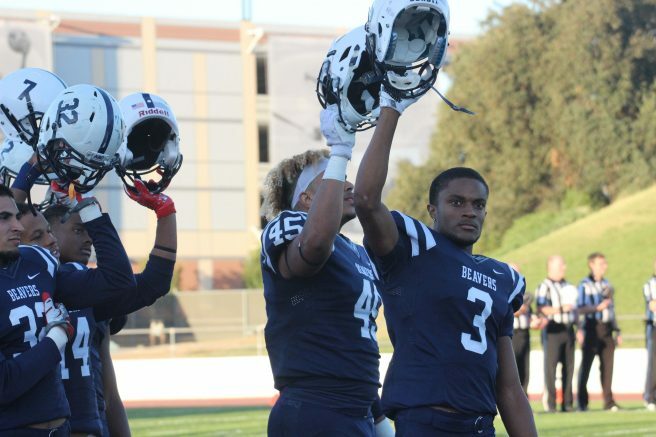 The American River College football team started and finished the night strong as it defeated San-Mateo 40-13 on Saturday. The Beavers are now 4-1 on the season. Coach Jon Osterhout said that it was a great game where everyone was on the same page. “That’s Beaver ball,” Osterhout said. ARC struck first with a touchdown in the first quarter when quarterback Griffin Dahn threw an 18 yard pass to wide receiver Jabarri Johnson, who ran the ball in for a touchdown. The extra point kick was blocked by San Mateo. The first quarter ended with ARC holding on to a 6-0 lead. At the start of the second quarter a facemask penalty allowed San Mateo to gain a 10-yard advantage, which helped them score a touchdown on ARC, and allowed them to take the lead 7-6. Near the end of the second quarter, Danh completed a 46-yard pass to receiver Lee Reed for a touchdown. The extra point hit the goal post, making the score 12-7. San Mateo intercepted the ball late in the first half, only to fumble it and have ARC recover it with 1.9 seconds left in the half. ARC kicked a field goal and went into halftime with a 15-7 lead. In the third quarter, a pass complete to wide receiver Namani Parker, brought the Beavers to first and goal. After two attempts to run the ball in, it was Dahn who kept the ball and ran it in for a one yard touchdown run on fourth down, The extra point was good which brought the score 22-7. As the fourth quarter began, Dahn padded the lead by throwing a 48 yard touchdown pass to wide receiver Brenden which was followed by a successful two-point conversion putting the Beavers up 30-7. Later in the fourth quarter, quarterback Chris Guillen returned from injury and scored a touchdown by running the ball in from four yards. With the extra point good, the score was brought to 37-7. ARC has a bye this week and their next game will be on Oct.15, against the the College of the Siskiyous, at 1 p.m.
Be the first to comment on "ARC blows out San Mateo 40-13"